The Professional & Amateur Pinball Association operates and sponsors pinball tournaments worldwide, while encouraging the spread of the "pinball bug" amongst players. The PAPA World Headquarters features more than 30,000 square feet of space, containing more than 450 pinball machines and other games. Located in Scott Township (near Pittsburgh, PA), we are open only twice a year for our world-class pinball tournaments, the World Pinball Championships and Pinburgh Match-Play Championship. The PAPA 16 World Pinball Championships were held August 8-11, 2013. We will be Live on PAPA TV! Broadcasting Saturday 9:30pm until close, and Sunday 10:45am until finals are complete. PAPA 16 featured four days of intense competition and a prize package in excess of $45,000! The Pinburgh 2013 Match-Play Championship was held April 11-14, 2013. Pinburgh features three solid days of competition for every player, offers a prize package of $60,000, and raises money for charity. The reigning Match-Play Champion, crowned at Pinburgh 2013, is Keith Elwin. 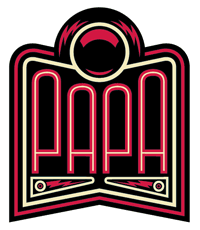 To learn more about PAPA, visit the links below; read our blog, Shoot Here and Here; visit us on Facebook or on Twitter; or subscribe to our Newsletter. We'll see you at the arcade! We are pleased to announce the 2013 PAPA Tournament Circuit! This edition of the Tournament Circuit operates in North America only and features tournaments we have carefully selected to provide the highest quality competitive experience available. The intent of the Tournament Circuit is to improve pinball tournaments worldwide, and to annually reward the best overall players. The 2013 Circuit was launched at our very own Pinburgh 2013, and concluded with a special playoff the day before Pinburgh 2014. Each Circuit event has the same predetermined value and the system will remain unchanged throughout the year, with updated standings appearing here after each event. Further information about the Tournament Circuit is available here.